Veer Savarkar International Airport also known as Port Blair Airport (IATA: IXZ, ICAO: VOPB), is a customs airport located 2 km (1.2 mi) south of Port Blair and is the main airport of the Andaman and Nicobar Islands of India. Originally known as "Port Blair Airport", it was renamed in 2002 after Vinayak Damodar Savarkar. It operates as a civil enclave, sharing airside facilities with INS Utkrosh of the Indian Navy. The airport has a single runway of 3,290 m (10,794 ft) in length, accommodating most narrow-body aircraft, that includes Airbus A320, Airbus A321, Boeing 737. 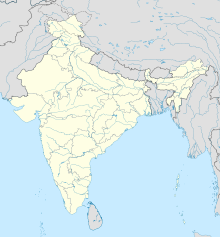 Except for the civilian terminal operated by the Airports Authority of India, all other air traffic operations over Port Blair are undertaken by the Indian Navy. There is only one terminal with 2 gates and no aerobridges. Buses are used to provide transportation from the terminal to the aircraft parked on the apron. In 2009, construction work commenced to expand the apron. A new terminal building is under construction and is scheduled for commissioning by June 2020. The AAI had initially projected a requirement of 26 acres of land for construction of the new terminal building. The local administration reduced it to almost 19 acres, 10.60 acres of which has been acquired from the Andaman & Nicobar Administration, 4.72 acres is from the Indian Navy, and the remaining 3.39 acres is yet to be acquired. ^ "TRAFFIC STATISTICS - DOMESTIC & INTERNATIONAL PASSENGERS". Aai.aero. Archived from the original (jsp) on 12 March 2015. Retrieved 31 December 2014. ^ "Lok Sabha Debates - Regarding Renaming Of Port Blair Airport In Andaman After The Name Of Port Blair airport on 8 May, 2002". www.indiankanoon.org. Government of India. Retrieved 17 April 2019. ^ a b "New Terminal Building at Port Blair Airport by March 2018". Press Information Bureau. 22 August 2013. Retrieved 6 January 2014. ^ "Andaman & Nicobar Command: Saga of Synergy". Sainik Samachar. Retrieved 9 January 2012. ^ "IndiGo new flights". goindigo.com. Retrieved 2018-09-21. ^ "SpiceJet schedule list". spicejet.com. Retrieved 2019-01-11. ^ "Vistara adds Chennai service from Feb 2018". Routesonline. Retrieved 2018-04-17. Airport information for VOPB at World Aero Data. Data current as of October 2006. This page was last edited on 17 April 2019, at 06:17 (UTC).